Sterling silver earrings in fish shape. Fish measure approx 2cm with silver ear-wires on top. Hand made from reclaimed silver in rural Mexico. Silverchilli is a Not for Profit Company… We support the running costs of a women’s and children’s centre where most of our Silversmiths live and work. We fund all the running costs of a support centre run by Tasquena Women’s Association in the neighbourhood where our Silversmiths Senora Tomasa, Senor Menchaca, Senor Nava & Senor Lopez Blanco all live and work. "We are so delighted to support the Tasquena Women’s & Children’s Centre. The vital services they provide are helping more than 100 women and children each month..."
More about the Tasquena Women’s & Children’s Centre… Four incredible women; a lawyer, a doctor, a psychology and a specialist education advisor have come together to provide specialist support for women and children right in the heart of Taxco. Services include women's health checks including sponsorship for treatment if cancers are found; pre-natal care and a rest facility in the busy market area where women have no choice but to carry on working right up to the moment they give birth: counselling services for women and children affected by domestic violence or family breakup through migration to work, and also, specialist education facilities for helping children with learning disabilities develop to their full potential. Computers for schools - Silverchilli style... At Lidia’s suggestion, we were very pleased to supply some laptops to Josue Mirlo Primary School in the suburbs of Mexico City. The school had won a grant to replace its broken classroom furniture. Lidia wanted us to get involved in helping this school in her local area back on its feet after years of under resourcing. After some contact with headmaster Senor Evaristo Cruz Manuel, we were pleased to supply 4 laptops to enable the children to have access to computers and the internet for the first time! Fair Trade brings things into focus...Terecarmen and Zoe visited the women's group who make the beautiful hand embroidered bags which your jewellery can be presented in. They live in a very remote village about 12 hours by bus from the southern regional city of Oaxaca - in the second poorest state in Mexico. The group is made up of about 24 women ranging in age from 30 to 75 years old, and represents a good cross section of the women in the village. Some of the women are widows, some are mothers to other women in the group and some have small children. Only about five of them speak Spanish and of them only two or three can write it, most just speak 'Mazateco' which is the language local to the area. We were very surprised when they asked us for spectacles! But, being 12 hours from the nearest city and the high costs of glasses, acquiring a pair can be quite a challenge for the group. 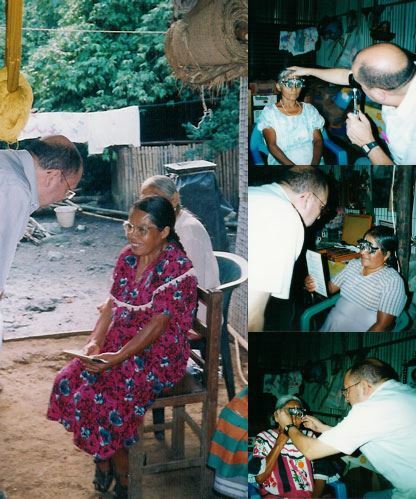 With a lot of help from Terecarmen Perez Bravo, Silverchilli's link with the women's group, we persuaded Oaxacan optician Senor Juarez to undertake the most unusual job of his career so far! We loaded him onto a plane, complete with instruments and eye testing equipment and flew him close to the village. Several intense hours later, more than 15 of the women had completed the eye tests and were looking forward to receiving their specs. Despite being a little camera shy, there was no mistaking how pleased they were with their specs. Fair Trade Loans... As part of our commitment to Fair Trade we make fair trade loans to help one of our producers to replace vital machinery or tools. Loans are interest free and can be paid back in finished jewellery rather than money, allowing our producers to keep their cashflow going whilst reducing their debt, ensuring that there is no threat to their everyday household income. They can pay back as much or as little as they want each time, and they have 3 years to pay.